Ainslie Beattie introduces you to the 12 Guest Editors who will be exploring life, transition, disasters, nuclear energy, and finding your inner (and outer) voice! Hello from the Comms Team at Transition Network. You all know by now that Rob is away on sabbatical writing a new book about Imagination. We felt it was the perfect time to build on our community of ideas from both inside and outside the network- of topics, happenings, and thoughts that are swirling around in these interesting, often tumultuous and sometimes frustrating times. You may remember that we put a call out a few months ago for Guest Editors and artists who would like to share their ideas with you. In the end, we had over 100 fantastic applications and it was quite a real honour and a challenge to pick the top 12. There are 4 people or groups that will be sharing one post a month for 6 months and there are 8 people or groups that will be sharing all their 6 posts over a one month period. These editors are from all over the world, sharing a whole range of interesting and diverse thinking, stories and art. We really hope you take the time to participate in these upcoming posts and do need to ask something of you along the way. The very best way to increase conversation, share stories and widen our thinking is to participate. We are therefore asking that you participate by commenting and sharing your thoughts after you read, watch or look. Please tell us what inspires you or troubles you or keeps you up at night. Tell us what has been triggered by your participation in our Guest Editor posts, and of course, if you feel inspired by these stories, please share them. Without further ado, welcome to Transition Network’s first 12 Guest Editors. Our first guest editor is Steph Blom, who, in her own words “works with words, old typewriters, and wool on projects focusing on connecting”. Connecting people with other people’s stories which in turn serves us to connect with ourselves. Her main interests lie in the combination of psychology and conceptual social art, with a focus on the humanity in us humans. Her work started in Buenos Aires with the project ‘Mujeres en círculo’: a combination of written words and woolwork expressing connections between women. It then continued with ‘Más que setenta’: a project focused on the elderly generation of women and their thoughts about life and death. For Transition Network she will continue on this road and will explore the theme of ‘Connecting with (your inner wise) Women’. 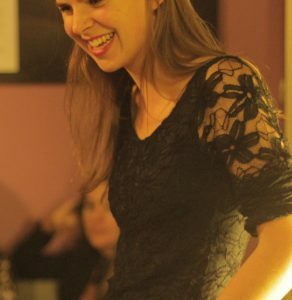 She is trained as a researcher in psychology, studying art therapy, and always with social art projects in her mind. She is Barcelona based at the moment therefore her work is often in Spanish and English. We are delighted to have Raquel and Daniel join us from Transition Portugal. Raquel and Daniel will be one of our 6-month editors and will help us to understand better the migration phenomenon around the world, the impacts on the local communities and on expats lives. They hope to find and share communities with good practices of integration, to improve themselves in their work, to promote network between expats and the local communities, and hopefully to inspire other projects around the world. Kate will be writing for us on Prosocial Power: Interdependence Across Generations. She poses the question “Do we create security with more cops, prisons, and surveillance – or with more resources for the millions of caregivers, teachers, and mentors who are already experts at keeping us healthy and safe?” She’ll be reporting on everyday superheroes who keep other people alive, as well as multigenerational groups who organize around principles of collectivism and sustainability, piecing together 21st-century villages of mutual aid and support. 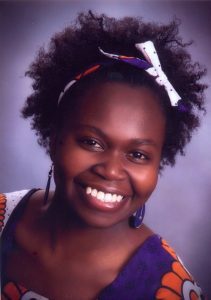 From Kenya we have Wangũi Kamonji, a researcher, storyteller, dancer, community builder, teacher and learner. “I am fascinated by design, traditions, urban issues and their rural sources, communities’ responses to environmental issues, and food (and other forms of) sovereignty. I write the blog fromtheroots.co.ke where I report on my findings from countries around the world including Brazil, Colombia, Mexico, South Africa, Tanzania, Kenya, India, Italy and Vietnam. In particular I explore how we can regenerate and revive the knowledge, education, economics, relationships, and environments to create a new just world”. While blogging for Transition, Wangũi will explore African environmentalism and African environmentalists in order to expand the face of who is considered an environmentalist in this large diverse continent, and which issues of concern exist besides the mildly stereotypical trees and wildlife. She will consider the place of the environmental consciousness from the viewpoint of some African environmentalists, their journeys, challenges, and triumphs. 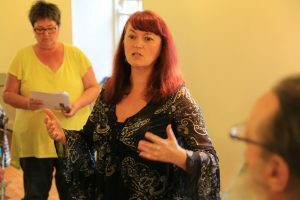 Ruth Cross is a facilitator, artist, project designer and changemaker with a background in choreography and theatre arts. She founded Cross Collaborations in 2009, a collective of makers dedicated to social and ecological activism and spent her early twenties making immersive and site specific performance and organising arts festivals. Ruth is now using creative tools to support transition within diverse communities. 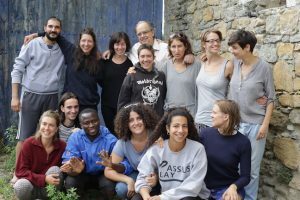 For example with Regeneration Project Granada a group of refugees, changemakers and local people working to create dignified regenerative livelihoods in Spain where she lives. 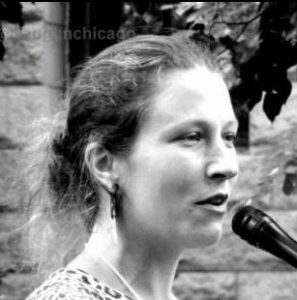 Ruth is co-founder of Eroles Project, who run international residencies for changemakers (Note that Eroles Project is also one of our separate Guest Editor projects). In September 2012 Ruth was invited to attend the International Transition Network Conference in London to host her letter project Post Present Future. During this event 34 people from Transition Towns around the world wrote a letter to their future self, capturing dreams and challenges of living a life in transition. 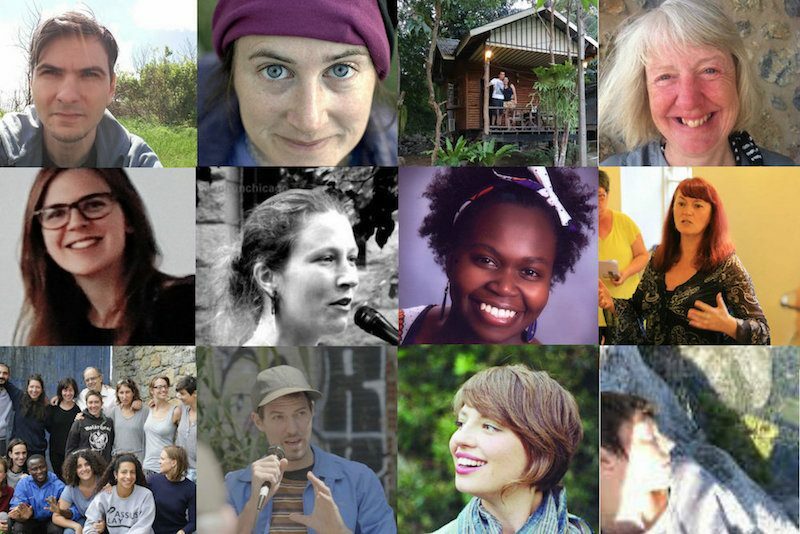 This September 2017, exactly five years on, Ruth will be collaborating with filmmakers to make FIVE YEARS a film which shows these 34 people reading their letter and reflecting on their journey over the last five years. Ruth’s blogs will share the process of making this film and offer a global sense of transition today. 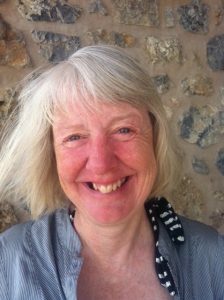 Helene Oakley will be writing in October, on the theme of “Transition from the edge and in-between”, looking at the issues of gender, sexuality and diversity as part of the debate on how we move towards a more eco-centric, equitable and regenerative world. Born in 1960, Shunro was brought up in the United States and Japan. 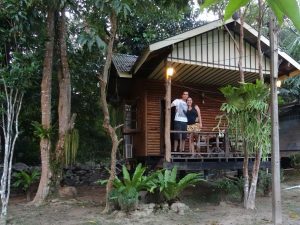 After completing a Permaculture course, Shunro sought ways to use his energy to impact the earth and change towards sustainability. He started Transition after working for a US medical equipment company in 2008, when he visited Findhorn, in Scotland and met Rob Hopkins and Joana Macy at a Positive Energy Conference. This movement was just what he was looking for – acting local and trying to move society towards becoming sustainable. 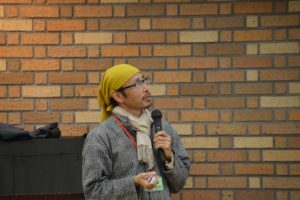 Shunro started a Transition Initiative in Hayama and then moved to Minami-Aso, where he is now living in a self-efficient lifestyle, producing food and energy. Following the combined natural and man-made disasters of the Tohoku Earthquake and the Fukushima nuclear plant explosion, many people were forced to rethink their lifestyle and beliefs, with many moving from lost homes and contaminated places. The Transition movement is so important in Japan as a way to show what is possible. 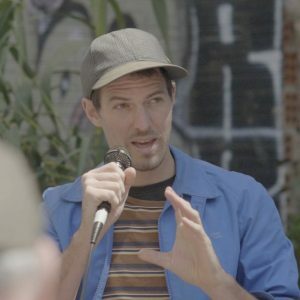 Shunro will be asking local Transition initiatives to tell stories about what has changed for themselves and what impact they have had in the community.” It’s not about what you can see, it is what you feel and the atmosphere of the place and the happiness of the people in the community. It’s really interesting to seek inside what Transition movement has brought in these nine years”. acoustic/roots band – Jenny and the Goodmen as well as writing for her community singing groups – her most recent writing project is working with children at a local school using their words and ideas to write a new song celebrating their community. Bid is a musician and singer playing Celtic harp fiddle and viola. She has worked with community choirs writing and singing music celebrating the land and history. Her current composition project is a suite of music for Celtic harp inspired by North Yorkshire. From Hungary, we are joined by Gergõ Benedek, a freelance journalist, blogger, sociologist and permaculturist. “We live in a village, an hours drive away from Budapest, right on the edge of a National Park forest, with my wife Joli, our cat Miri, and our dwarf rabbit Mózes”. Gergõ has been working on a lot of things related to text – articles for magazines, I’ve been responsible for the PR of rural development EU funds, I’ve been a copywriter and social media expert at an ad agency, and been a Language Tester for a big video game corporation. 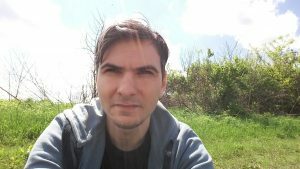 You can connect with Georgõ on Twitter here. 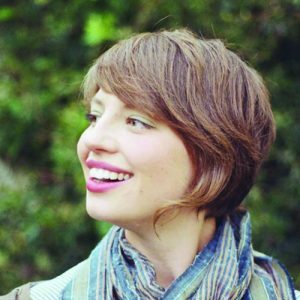 Kate Heath joins us from the UK, where she will be sharing conversations about climate change. She has worked in the humanitarian field over the last 6 years, in Nepal after the earthquake, in West Africa responding to Ebola, in eastern DRC and most recently supporting the drought response in Ethiopia. I am now convinced that limiting global temperature rise to 1.5oC is the most urgent humanitarian issue of our day. 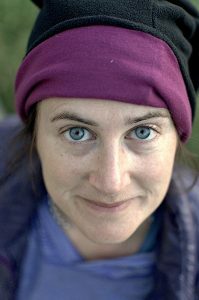 Kate tells us: “I am thus currently reorienting towards helping us collectively achieve a carbon-neutral 21st century. Before specialising in Water, Sanitation and Hygiene, I studied Environmental Sciences, but originally come from artistic roots, training firstly as an actor. I am increasingly intrigued by how the arts may help make the complex issue of climate change more tangible and understandable. I tend to make sense of my gnarliest grapplings by writing poems. Whilst I’ve always been passionate about social justice, and have done all sorts of jobs along the way, I’ve been struck by the need to overcome my reticence to speak out and own my own opinion as an individual citizen. I grew up in Norfolk in the UK, and am currently based in Paris where my husband now works. We love the municipal bicycles but are still grieving the discovery that cheese is not a low-carbon food. HI Kate, Bid here. This looks brilliant. So looking forward to reading your blog.